How Fast Is Poverty Growing in the Suburbs? Poverty is growing in America, and since the 2000s, poverty has been growing faster in the suburbs than it has in our cities. Federal programs created to respond to poverty in distressed urban neighborhoods are inflexible and unresponsive to suburban needs. It is now up to policymakers at the local and regional level to devise solutions that are collaborative and interdisciplinary. These are some of the conclusions to research begun in 2006 by Elizabeth Kneebone and Alan Berube, Fellows at the Brooking Institute, in their book, Confronting Suburban Poverty in America. Using the US federal poverty threshold as the guideline, from 2000 – 2010, the nation’s poor population grew from 33.9 million to a record 46.2 million. In that time period, the percentage of this population living in the suburban areas of the 100 largest metro regions of the country rose by more than 53%. That was more than twice the rate of increase in cities, where the poor population grew by 23%. These suburban areas include every racial and ethnic group living in poverty, and more than 1/3 are children under the age of 18. Sixty-six percent of poor suburban families have at least one resident who works full-time or part-time white, and 43% are female-headed households. There are many factors, but the data show us that the increased poverty isn’t solely the result of poor people moving from the city to the suburbs, although that does occur. The significant jump in suburban poverty is because more suburban residents are becoming poor.While we note that these increases began in the early 2000s, suburban areas were hit harder than urban areas by the Great Recession, and the subprime mortgage crisis and foreclosures had a more severe impact on the suburbs, causing households to lose significant assets. Many people lost jobs, and they have yet to regain full-time employment. Those who are employed have lower wage jobs or stagnant incomes making it difficult to get ahead. As a result, many workers live paycheck to paycheck. While wages have remained flat, other expenses have increased – transportation, healthcare and especially housing costs, which have increased substantially. The average rent for a two bedroom apartment in the DC metro area is $1,600, requiring an annual income of $65,000, or four full time minimum wage jobs, to be affordable. It is not uncommon for a poor household to pay more that 50% of their monthly income for rent, leaving little money for food, transportation, childcare and medical expenses. How are we responding to increasing suburban poverty? It is a challenge to be poor in suburban areas because many jurisdictions are not built or equipped to address growing poverty. Safety net services are provided by local governments, but their budgets have not kept up with the demand, stretching staff and resources to a tipping point. And while the number of nonprofit organizations serving low income households in the suburbs has grown, most organizations are small with sporadic or unreliable funding. Additionally, the absence of affordable, reliable mass transit in suburban areas makes access to these services difficult due to widely scattered locations. Schools have also been pulled into the mix, and parents of children who are eligible for free and reduced lunches often look to schools for information about safety net services. What will it take to create lasting prosperity for families in poverty? Effective collaboration between sectors and among localities that could attract funding for regional efforts. Use zoning and financial tools to promote mixed income neighborhoods with affordable housing, and access to transit, jobs and community amenities. These measures that help alleviate poverty in our communities will also ensure that we remain a healthy, diverse, successful and resilient region; one that will be better positioned to achieve true economicgrowth and prosperity. 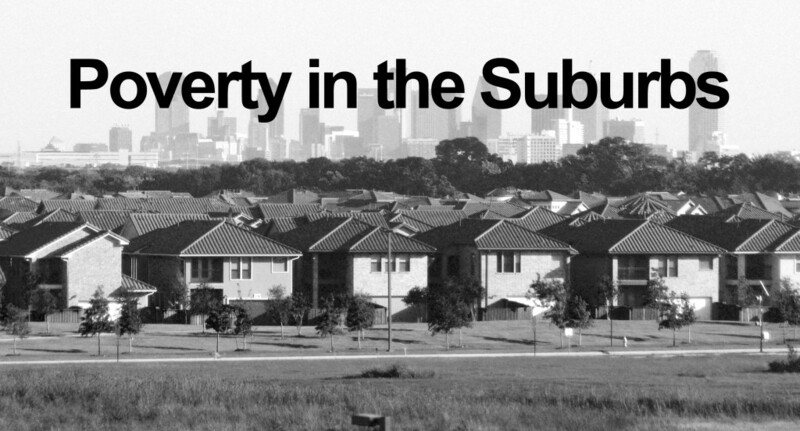 Go here to follow the national conversation about suburban poverty.